The hike to the top of Mount Tallac near Emerald Bay is one of the more difficult hikes in the area, and, from the amount of photos and commentaries, also one of the most rewarding. From the top of this 9.5 mile round trip hike you can see Emerald Bay, Cascade Lake, Fallen Leaf Lake, Desolation Wilderness and the entire South Shore of Lake Tahoe. The elevation gain is 3,500 feet, so be prepared for some terrain change from forest and alpine lakes at the bottom to scree and boulders at the top. Bring plenty of water; there are not usually any sources to draw from. Directions: The Mount Tallac trailhead is located on Highway 89 between Camp Richardson and Emerald Bay. Take the Mount Tallac Road to the trailhead. As one of the tallest peaks in the Lake Tahoe area, Mount Rose towers over Reno and the North Shore of the lake. The trailhead is located at the highest year-round pass in the country (8,900 feet) on Highway 431 and climbs to 10,776 feet. The 10 mile round trip hike initially meanders through forest and meadows and then turns into more vertical, rocky terrain as you hit the switchbacks near the top. On a clear day at the top, you'll be able to see Reno and Sparks, Carson City, the Tahoe Basin, and the Boca and Stampede reservoirs. You may even be able to see Mount Lassen in Northern California. Directions: The Mount Rose trailhead begins at the top of the Mount Rose Summit on Highway 431. From Incline Village, drive West on Highway 28 til the 28/431 interchange and turn right onto Highway 431. If you are in the Emerald Bay area, take the steep switchback trail from the Vikingsholm Castle up to the Vikingsholm parking lot. Follow the road to the entrance of Desolation Wilderness and the Eagle Falls Trailhead. This is a very popular hiking and parking area in the summer, so get there early. The trail up to Eagle Lake is only one mile up, but the initial part of the trail is steep and rocky. However, about halfway up, you will get some stunning views of Emerald Bay. Eagle Lake itself is really beautiful and this trail will give you access to additional hiking in the Desolation area. Directions: From South Lake Tahoe drive West on Highway 89 towards Emerald Bay. At the overlook for Emerald Bay, look for the signs for the Eagle Falls trailhead/Desolation Wilderness parking area. The parking fills up quickly in the summer and fall, so get there early. You will be ticketed if you park on the side of the road. This trail is another way to access Desolation Wilderness, but if you want to keep it simple, just stick to the first part with its low elevation gain. From the Echo Chalet on Lower Echo Lake you can either start hiking on the trail that heads into Desolation, or take a water taxi across Lower Echo Lake to get a head start on the trail. The trail has some beautiful views of the mountains in Desolation and access to the cool, beautiful alpine lakes of Tamarack and Ralston. Directions: The trailhead is located on Highway 50 at Echo Summit. Turn onto Johnson Pass Road. Stay left and the road will lead you to the parking area by Lower Echo Lake. To access the beautiful fish hatchery of Marlette Lake, start at the Spooner Lake parking lot and follow the North Canyon trail through aspen and pine trees. The trail is popular with mountain bikers, so keep an eye out for them as they zoom down the trail. The elevation gain for this trail is gradual at 1,200 feet, but you can get some great views of Lake Tahoe near the top. Marlette is a nice lake to have a picnic and relax in the sunshine. Directions: The trailhead is off of Highway 50 near Spooner Summit at the Spooner Lake parking lot. There is a parking fee. This hidden trail near Soda Springs doesn't have a view of Lake Tahoe, but it does give the average hiker a nice, challenging walk through the woods. This trail is also popular with mountain bikers, so head to the trail early in the morning. The trail passes through various terrain including creeks, rocky hills and deep forest before ending up at Lower Lola Montez Lake at the base of a granite shelf. This is a great lake for swimming in and stays fairly undiscovered by other hikers. This is another great hike that doesn't have a view of Tahoe, but has an interesting variety of terrain. It also supports huge blooms of spring and summer wildflowers, and expansive views of the lakes and mountains in the Mokelumne Wilderness south of Tahoe. From the Carson Pass on Highway 88, you can access the trail and hike in the forest from little Frog Lake, to Round Top Lake to Winnemucca Lake. This hike is around 6.5 miles with a 2,300 foot elevation gain, but you can extend it by heading down into the beautiful canyon that holds Fourth of July Lake which is surprisingly empty around Fourth of July. Directions: From South Lake Tahoe, take Highway 89 south through Meyers and continue south. Highway 89 will become Luther Pass Road. When you come to the 89/88 interchange, turn right onto Highway 88. Stay on 88 until you come to the top of Carson Pass. You will see the Carson Ranger station and the parking lot on the left hand side. The trailhead parking lot has a parking fee. 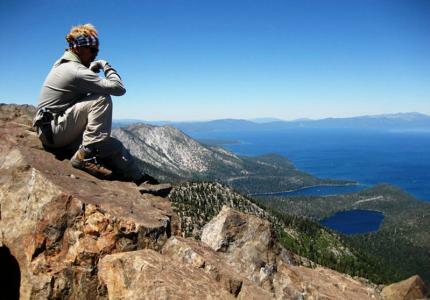 One of the best ways to see the 165 mile long Tahoe Rim trail is to break it up into day hikes that vary from around 6-20 miles each. The Tahoe Rim Trail Association has a nice guide on these sections of the TRT regarding where to access the trailheads. Before you know it, you'll have completed the entire trail. Time to celebrate! This short and easy hike is great for families with small children or people with disabilities. It loops through granite boulders, pine forests and mountain streams at the summit of Mount Rose. The elevation is high at 8,740 feet, but the trail is level. There is plenty of parking off of Highway 431 at the summit as well as pit toilets. Directions: From Incline Village, drive West on Highway 28 until the 28/431 interchange and turn right onto Highway 431. Drive up the mountain until you come to the summit. There will be signs and a parking area for the trail on the right hand side. This is one of the only trails that follows the shoreline of Lake Tahoe. Located on the south shore between D.L. Bliss State Park and Emerald Bay, this long but fairly easy trail gives you some great views of the blue water from the sheer drop along a large portion of it, and access to some nice little swimming coves. From D.L. Bliss, the trail takes you to Emerald Bay and the Vikingsholm Castle around the bay to Eagle Point. Directions: The trailhead can be accessed from the Emerald Bay Boat-In campground on the south end or from Lester Beach at D.L. Bliss on the north end.